last weekend, spent at a retreat for my business + technology club, was full of firsts. some of those firsts are probably best left unsaid, in that hush hush what happens here stays here manner. (there were interesting bits that i felt compelled to share with friends not there, however). others included driving in san diego (surprisingly unfun and parking was a bear) and stuffing too many people into a house. a bunch of us slept on the ground, but there were enough chair/couch cushions to keep us from being too uncomfy (different uncomfortable, but anyways). 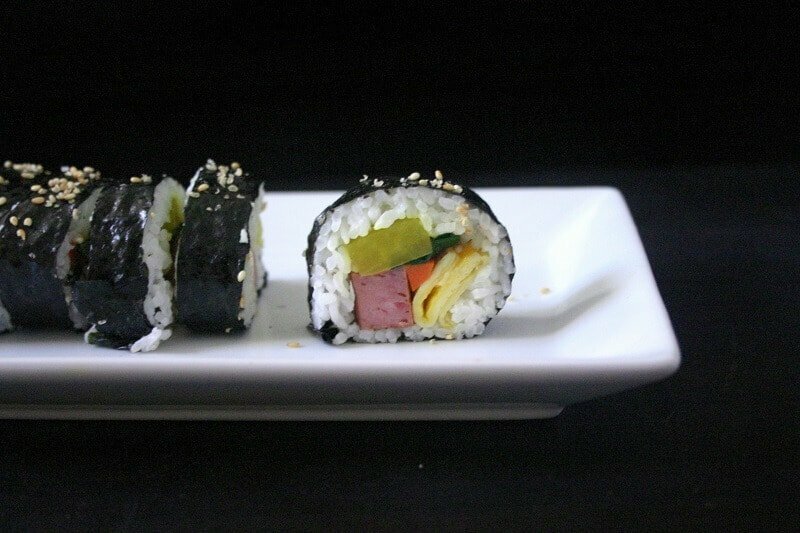 this wasn’t my first time making sushi, but it was my first time making spam kimbap, and i loved it. in case you don’t know, kimbap is kind of like the korean version of sushi. (i had a friend who would would vehemently disagree that kimbap and sushi were similar in any sort of way, but it seems reasonable to me that the two could be historically linked). 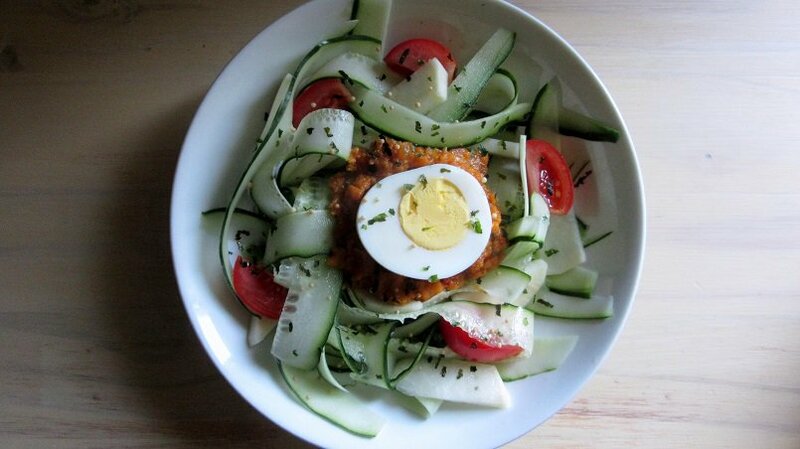 it’s filled with a mix of raw, cooked and pickled veggies, and can be customized protein-wise. for this spam kimbap, i’ve used scrambled eggs and pan-fried spam, but i’ve also had it with bulgogi (LOVE) and american cheese (this is gross. i’m also not a fan of american cheese in general). 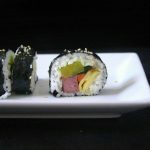 This Spam kimbap (aka Korean sushi with Spam and tons of vegetables) does require a fair amount of prep work, but it's so colorful and flavorful that it's well worth it. Pan-fry the Spam in a large non-stick pan over medium heat until golden brown on both sides. Drain on a paper towel lined plate, then slice into matchsticks. Pour off most of the fat from the pan. Beat the eggs until homogenous. In the same pan over medium-low heat, add the eggs. Use a rubber spatula to move the eggs around a bit (and help them cook faster), making sure that the eggs cover the bottom of the pan once you're done stirring. Cook until almost set on top, then flip and cook until the other side sets. Don't worry if you can flip it pretty; you can't tell once you roll it all up and slice the kimbap. Transfer the eggs to a cutting board, and slice into strips similar in width to the Spam's width. In the same pan over medium heat, add a bit of oil (or the Spam fat), and saute the chard until it's wilted. Place a bamboo sushi rolling mat on a large, flat surface. Place a piece of plastic wrap slightly larger than the mat on top of the rolling mat. Grab a small dish of water, and gather all of your ingredients near your rolling mat. Place a piece of seaweed, matte side up/visible, on the plastic wrap. Cover most of the surface of the seaweed (leave a few inches at the edge farthest from you rice-free) with a thin, even layer of rice, using your fingers to help spread it out. If the rice sticks to your fingers, dunk them in the bowl of water before proceeding. Create a pile of the different fillings near the edge closest to you. You want a strip that runs along the width of the seaweed (ie if the carrots are shorter than that, add a few more matchsticks to the carrot-less parts of the kimbap) of each ingredient. Squeezing firmly and starting from the side closest to you, gently roll the kimbap up using the mat and plastic wrap as a guide. Make sure that you don't roll the mat or plastic into the kimbap. Set the roll seam side down on a plate. If the roll doesn't seem to want to stick to itself, run a damp fingertip along the edge of the plain seaweed to help it stick. Repeat the assembly/rolling process with the remaining ingredients. You can make the kimbap a few hours ahead: wrap the rolls in plastic wrap at this stage and store in a cool, dry place (do not refrigerate). Brush a small amount of sesame oil over each roll, and sprinkle with sesame seeds. Using a sharp, large knife, cut off the ends of the kimbap to make it neat, then slice and serve. The aim when you're prepping the ingredients is to get them roughly the same width (different lengths is inevitable and fine). 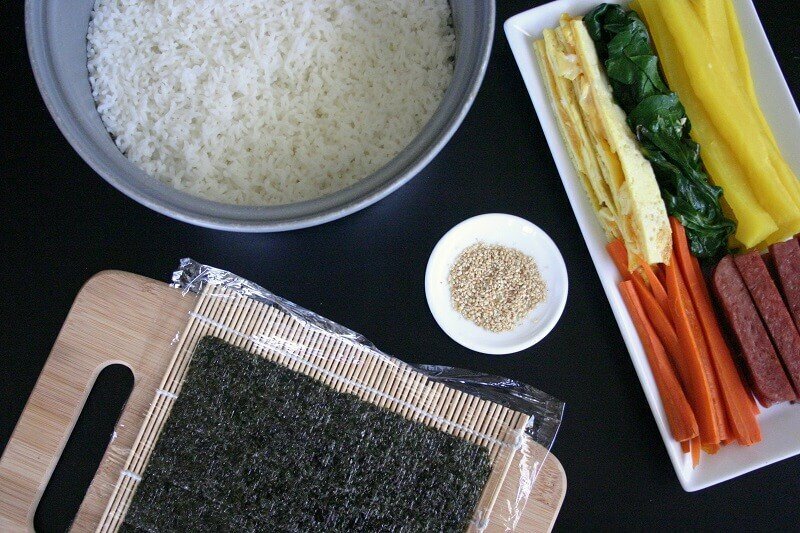 Not necessary, but it makes it easier and faster to assemble the kimbap. You can sub in bulgogi or sauteed shiitake mushrooms or any protein really for the Spam. (You may have leftover Spam). Other possible subs/additions: beet greens, spinach, fish cake, imitation crab, cucumber, etc. hahah yeah and i can confirm that the american cheese is even less enticing when the kimbap has been sitting out for a few hours, and it’s not hot and it’s not cold and it’s some weird in between. tbh, the bulgogi ones are the best! (better than spam even, haha). the spam ones are just easier (; but if you find pre-marinated bulgogi in a korean supermarket near you, that definitely makes it easier too! I’ve always wanted to make sushi, er, kimbap I mean. This looks and sounds wonderful! I have to admit I’m not a spam fan, but I always tell people that when they don’t like something they just haven’t had it prepared well. So in this case I would indeed try the spam. Thanks for the recipe! you can definitely leave out or sub the spam! i’ve seen vegetarian and vegan kimbaps before, or you can use grilled chicken, grilled bulgogi, etc. I can’t lie, spam freaks me out. BUT you have encouraged me to try making my own sushi!! Your rolls are gorgeous! it’s more work, but you should look up the sushi that has shapes inside! i’m probably not explaining it very well, but i made one that looks like a car on the inside of the spam (i tried looking up “sushi that looks like a car,” and that wasn’t helpful at all. sigh) when i was a kid. they’re really cool looking (and got everyone in my class who didn’t want to eat it to try it out!). So pretty! Not sure about the Spam, but I would LOVE the shiitake mushroom version! Haha… I agree that some things should not be shared with people on the Internet. I hope that your retreat was fun despite the cramped space. 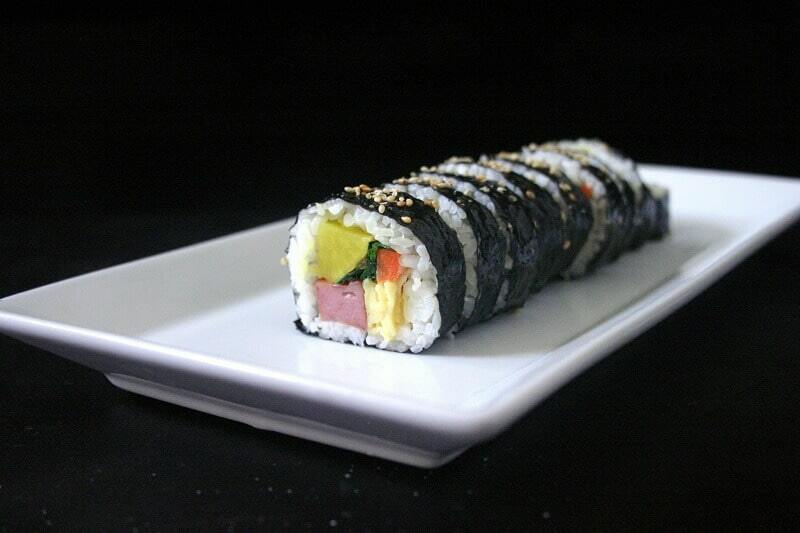 Kimbap does look like a maki sushi roll so I can see how they are related. It looks really tasty! oh, the retreat was lots of fun (; and very memorable! kimbap looks so much like sushi, but i feel like the filings are the main differentiation. that being said, i feel like one evolved from the other (; it must have! oh, it is! i feel like there a few korean dishes which show how they were affected by the war + american influences, especially budae jiggae. it’s a kimchi stew, with ham/spam/sausages/baked beans, and it’s still popular today! As you know I don’t eat meat but I can still appreicate a well made sushi roll from afar. Oh man I could eat danmuji by the bucket load I love dem pickles! Never had spam before – meat in a can? (in sushi or kimbap of any kind) but you have actually kind of made me want to try it. YES GIVE ME ALL THE DANMUJI (i got korean fried chicken last weekend with a friend and you can bet i hoarded that stuff). spam is an interesting experience (; if you like (or at least are open to the idea of) processed meat, you’ll probably like it. and hahaha there are some things that one of my friends wished we never remembered/never brought up again (but because we are nice, we bug them about it all the time lol). I didn’t know, something similar to sushi existed too! This Kimbap does involve a bit of work in prepping all those filling ingredients..But every bit worth it! it’s not a quick recipe, that’s for sure (; which makes it even more impressive that one of my childhood friend’s moms would wake up super early to make this fresh for her a few times a week!!! Hope you had fun on the retreat! Oh man, I would feel claustrophobic if I had to share a place with a bunch of people! Weird, but I’ve never had kimbap before even though I go to Korean supermarkets and restaurants all the time. They look delicious though! OK, I need to make it a goal to try it out on of these days. I like how you can use a lot of ingredients to make something tasty! ahhhh you’ll have to try it at the korean markets/restaurants! i personally feel like it’s more worth at supermarkets, because it’s cheaper and still really fresh and tasty. I’ve never made my own sushi or kimbap, so this is helpful! Love that you have lots of veggies packed in there! oooh, you’ll have to try making sushi and/or kimbap someday! yeah, i love all the veggies in kimbap too (: sushi is great but sometimes i find myself wishing there were more veggies in them lol. This looks so good! I haven’t had kimbap in such a long time…I’ve always wanted to make some on my own — how did you get these to hold together? oooh you’ll have to make them then! (or just find a nice korean supermarket and drop $5 (; both work!). as for getting them to hold together- i dab a bit of water around the edge, and then let the rolls sit seam side down while i assemble the rest. This looks amazing, Heather! I love sushi and definitely agree that kimbap is similar. I was so disappointed in myself because I went to Hawaii last year and didn’t try spam once! 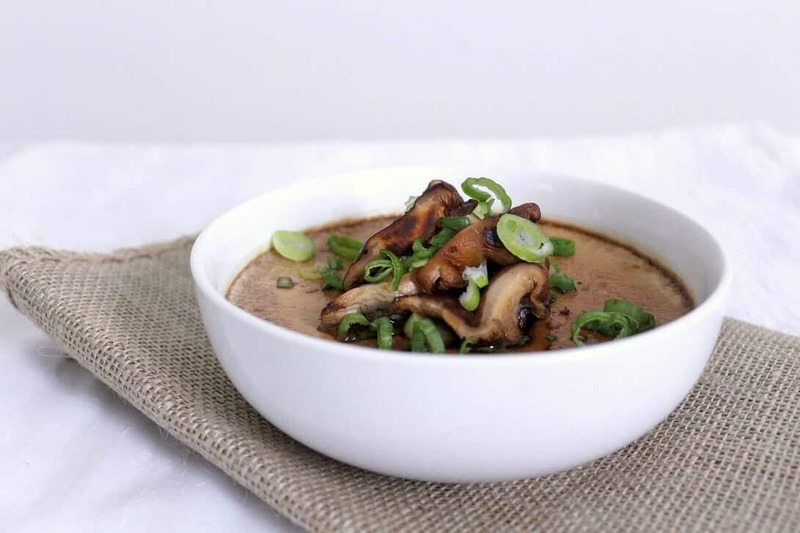 Now’s my chance with your amazingly simple dish. 🙂 I have to admit though. I’m a huge fan of American cheese. Should I try this with some American cheese rolled in? Haha maybe not. Either way, I’m so excited to try this! ahhh what?! you’ll have to try spam now that you’re home (; it should be pretty easy to find. and you can use american cheese here- i’m biased anyways and am not a huge fan of american cheese to begin with. it’s so hard to beat spam fried rice though!! OOOH i haven’t had the garlic spam- i do love garlic, but somehow it was kind of scary to me idk. will have to pick that one up next time. and ma la flavored spam?!?! i haven’t even seen that one in stores!